Owning a scooter makes you a part of an elite group filled with its share of quirky folks and average joes. Scooterists, as they like to refer to themselves, are young or old, liberal or conservative, thrifty or lavish, impulsive or reserved. Some prefer the vintage style while others love the sleek and modern look. Looking for a little fun insight about scooter owners? Read on about the types of scooterists. We may all dream of zipping through the streets of Key West in a pair of cut-off shorts and flip flops salty mist on our skin. No matter the region of the country, the Beach Bum scooter owner knows how to have fun and truly enjoy like. Ever try maneuvering The Big City in your car? Fughettaboutit! A scooter in the city is just smart. Whether to make a quick trip to the market or to meet a friend for coffee, hop on your scooter and be there lickity split. These Generation Yers are always ahead of, or creating the latest trends. They are environmentally aware, fashionable, and tech smart. For this group, scooters are a perfect mode of transportation. Check out your social media feed, and surely you will see a hipster or two riding scooters. For the super environmentally aware scooters make sense. Some models get almost 100 miles to the gallon. There are full-size electric models available as well. These two facts alone will work towards reducing your carbon footprint. Celebrities are always caught by the paparazzi buzzing around on scooters either on vacation or throughout the city. While we cannot guarantee a mob scene, we can promise you will look super cool and elevate your seemingly mundane daily errands whilst on your scooter. 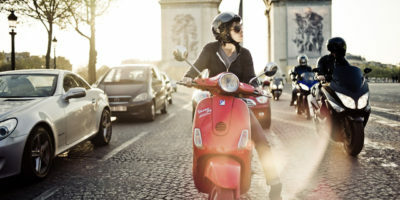 Scooters are a relatively inexpensive mode of transportation and get excellent gas mileage. They also cost less to insure than cars. These points add up to real savings any prudent consumer could appreciate. Conversely, we have folks who have bought scooters as an alternative for the family for short jaunts about town, so as to not put extra miles or wear and tear on the Benz or Beamer. Look, ya cannot fault this bit of practicality. Finding parking on campus can be a downright bear, especially when running late for class. Scooters offer a bit of flexibility when it comes to parking options. They are also cheap to insure and need only a few bucks to fill up the tank. The perfect mode for the student on the go! Scooterists love riding through the open air, and who better to share this amazing experience than with their furry companion? Folks have been spotted zooming through town with their pooches, kitties, even the occasional potbelly pig. Thus, rockers, artists, alternative-thinking people ride scooters. They do it for whatever their personal reasons but let’s be honest scooters make economic sense for everyone. Stop by Chesapeake Cycles and check out our selection of Scooters. Take one for a test spin today!